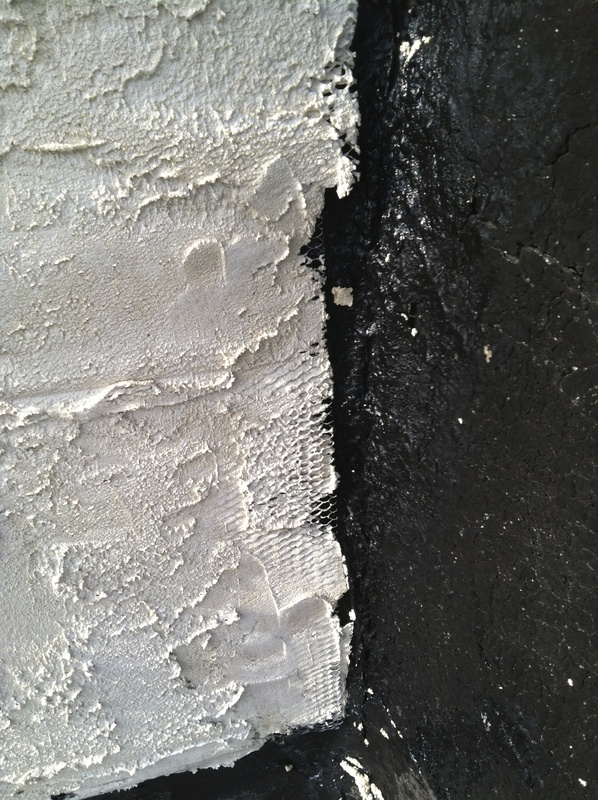 This is a picture of a stucco job performed on a third floor row home in Philadelphia. The house is surrounded by two story homes, but this one had an addition built to add on another bedroom for a large family. Months into living in the extra space, the home owners noticed water damage on the ceiling and in a closet. When we were called out to inspect the intrusion and deal with the water loss, we quickly noticed that the stucco was partially completed and skimmed on so thin that you could see the wire lath. The home owners had no access to the roof and weren’t going to climb up a ladder, so when they saw the stucco, they saw it from the ground and everything appeared to be okay. But the contractor clearly didn’t use enough cement on the first coat, if he even applied a scratch at all. Additionally, the black obstruction to the right is a chimney which wasn’t covered with stucco at all two feet up from the next roof and was set too far back to notice. A situation like this ended up in court, and the home owner had to pay thousands for the remediation, reconstruction and reapplication of the stucco. You must always remember to check contractors work, or have them photograph everything if you’re unable to check yourself. Visit our website at biowashing.com for more information.